Art in Hats will be returning to Second Life in November 2015, this year supporting the inaugural Team Diabetes of Second Life season in support of the American Diabetes Association. Founded in 2013 by Quan Lavender, the initial event offered a means for SL couture designers and artists to present images of hats as statement of art, each with a story to tell. In 2014, the event saw over 100 hats and their paired images displayed by designers and photographers, with donations made during the event (including a silent auction) going to support the work of Feed A Smile. 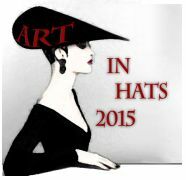 For 2015, the Art In Hats even will take place between November 4th and 14th, 2015 inclusive, with Emma Portilo taking on the lead as Top Hat Coordinator, supported by Chloe Seljan as Events Coordinator (particularly for European time zone events), and designer Kimmera Madison a Coordinator and builder, and Johannes1977 Resident as a Coordinator and managing entertainments which meet US time zones. If you are an artist, designer or creator of some sort and want to express yourself through hats, headpieces, attachments to the head of some sort (LOL) then this is certainly the event for you! Art in Hats marries art to fashion and brings about new amazing works! Enter now by using the Sign Me Up! link and completing an application! Not a creator type? Do you blog or are you a great photographer? We’re also looking for you! Use the Sign Me Up! link to complete the appropriate application! Do be aware that places are limited, so if you are interested in participating in, or supporting, this year’s event, you might be best served by applying sooner rather than later. For further information and updates on the event, be sure to track the Art in Hats website. Over the course of a century, Le Fantôme de l’Opéra’s cloak has been thrown wide to encompass many retellings and adaptations in every medium – film, radio, stage, television and print – since Gaston Leroux first saw it serialised in the pages of Le Gaulois in 1909/10. Many of these adaptations, such as the 1943 film starring Claude Rains in the titular role, have themselves been folded back into the original story, adding to the legend. And now, through until October 21st, that cloak has been thrown over MetaLES in the form of a tribute to the original story and some of its many interpretations, entitled A Bit of Red, by Kicca Igaly and Nessuno Myoo. Floating over the landing point on a series of large blocks (between which it is possible to fall if you’re not careful), lay key scenes from the story. Most will be recognisable to those at least familiar with Andrew Lloyd Webber’s 1986 musical production (and short notes, indicated by the presence of a rose or rose petal, help give context to each scene), although the influences do go back to the original tale, and reflect some of the other many adaptations. Thus we have, for example, the motifs of the Phantom’s mask and the opera house itself (although sadly, not the great chandelier); there is a familiar great pipe organ, from which huge spherical notes float, and there is a the ruin of a boat, and an iron grate through which one can drop to a tunnel below, all representative of the story; the last referencing the labyrinth of tunnels and cellars beneath the opera house and which play a key role in the tale. Finally, raised above the centre of everything, is a dais on which Erik, Le Fantôme and Christine stand, separated by a mirror, symbolically broken on one side, whole on the other. Alongside of these there elements rich in symbolism, such as the broken cage. In it we can see Erik’s desire to hold Christine as his own – captive, if needs be – and also his change of heart towards her in setting her free. It also, perhaps, symbolises his own heart held captive to her and destined only to be broken. Or if you prefer, there is an alter, reminding us on the one hand of Erik’s attempt to force Christine to marry him under the threat of destruction and the death of others, and on the other of her love for Raoul and her desire to be with him. Then there is the memorial to Christine. It both serves as an affirmation of Erik’s promise to the Persian within the novel that he did indeed set both Christine and Raoul free, and as a reference to the 2004 Joel Schumacher film, carrying as it does Christine’s married title and her dates of birth and death. In all A Bit of Red has been carefully constructed and does present an interesting reflection on Leroux’s work and its various offspring. The intricate design the weaving of the key aspects of the tale into understandable vignettes is undeniable. Nevertheless, in exploring, reading and witnessing, I couldn’t help but feel I was merely that: an observer. I didn’t feel as involved in the installation as I had perhaps hoped on my arrival; the Phantom wasn’t there, inside my mind, so to speak. Perhaps he’ll be in yours.